Not to be confused with synapse, synapsis, or synopsis. Synapsids were originally defined at the turn of the 20th century as one of the four main subclasses of reptiles, on the basis of their distinctive temporal openings. These openings in the cheek bones allowed the attachment of larger jaw muscles, hence a more efficient bite. Synapsids were considered to be the reptilian lineage that led to mammals; they gradually evolved increasingly mammalian features, hence the name "mammal-like reptiles", which became a broad, traditional description for all Paleozoic synapsids. The traditional classification of synapsids as reptiles is continued by some palaeontologists (Colbert & Morales 2001). In the 1990s, this approach was complemented by a cladistic one, according to which the only valid groups are those that include common ancestors and all of their descendants: these are known as monophyletic groups, or clades. Phylogenetically, synapsids are the entire synapsid/mammal branch of the tree of life, though in practice the term is most often used when referring to the reptile-grade synapsids. The term "mammal-like reptiles" represents a paraphyletic grade, but is commonly used both colloquially and in the technical literature to refer to all non-mammalian synapsids. The actual monophyly of Synapsida is not in doubt, however, and the expressions "Synapsida contains the mammals" and "synapsids gave rise to the mammals" both express the same phylogenetic hypothesis. The synapsids are traditionally divided into a primitive group and an advanced group, known respectively as pelycosaurs and therapsids. 'Pelycosaurs' make up the six most primitive families of synapsids. They were all rather lizard-like, with sprawling gait and possibly horny scutes. The therapsids contain the more advanced synapsids, having a more erect pose and possibly hair, at least in some forms. In traditional taxonomy, the Synapsida encompasses two distinct grades successively closer to mammals: the low-slung pelycosaurs have given rise to the more erect therapsids, who in their turn have given rise to the mammals. In traditional vertebrate classification, the Pelycosauria and Therapsida were both considered orders of the subclass Synapsida. In phylogenetic nomenclature, the terms are used somewhat differently, as the daughter clades are included. Most papers published during the 21st century have treated "Pelycosauria" as an informal grouping of primitive members. Therapsida has remained in use as a clade containing both the traditional therapsid families and mammals. However, in practical usage, the terms are used almost exclusively when referring to the more basal members that lie outside of Mammaliaformes. The synapsids are distinguished by a single hole, known as the temporal fenestra, in the skull behind each eye. This schematic shows the skull viewed from the left side. The middle opening is the orbit of the eye; the opening to the right of it is the temporal fenestra. Synapsids evolved a temporal fenestra behind each eye orbit on the lateral surface of the skull. It may have provided new attachment sites for jaw muscles. A similar development took place in the diapsids, which evolved two rather than one opening behind each eye. Originally, the openings in the skull left the inner cranium covered only by the jaw muscles, but in higher therapsids and mammals, the sphenoid bone has expanded to close the opening. This has left the lower margin of the opening as an arch extending from the lower edges of the braincase. Synapsids are characterized by having differentiated teeth. These include the canines, molars, and incisors. The trend towards differentiation is found in some labyrinthodonts and early anapsid reptilians in the form of enlargement of the first teeth on the maxilla, forming a form of protocanines. This trait was subsequently lost in the sauropsid line, but developed further in the synapsids. Early synapsids could have two or even three enlarged "canines", but in the therapsids, the pattern had settled to one canine in each upper jaw half. The lower canines developed later. The jaw transition is a good classification tool, as most other fossilized features that make a chronological progression from a reptile-like to a mammalian condition follow the progression of the jaw transition. The mandible, or lower jaw, consists of a single, tooth-bearing bone in mammals (the dentary), whereas the lower jaw of modern and prehistoric reptiles consists of a conglomeration of smaller bones (including the dentary, articular, and others). As they evolved in synapsids, these jaw bones were reduced in size and either lost or, in the case of the articular, gradually moved into the ear, forming one of the middle ear bones: while modern mammals possess the malleus, incus and stapes, basal synapsids (like all other tetrapods) possess only a stapes. The malleus is derived from the articular (a lower jaw bone), while the incus is derived from the quadrate (a cranial bone). Mammalian jaw structures are also set apart by the dentary-squamosal jaw joint. In this form of jaw joint, the dentary forms a connection with a depression in the squamosal known as the glenoid cavity. In contrast, all other jawed vertebrates, including reptiles and nonmammalian synapsids, possess a jaw joint in which one of the smaller bones of the lower jaw, the articular, makes a connection with a bone of the cranium called the quadrate bone to form the articular-quadrate jaw joint. In forms transitional to mammals, the jaw joint is composed of a large, lower jaw bone (similar to the dentary found in mammals) that does not connect to the squamosal, but connects to the quadrate with a receding articular bone. Over time, as synapsids became more mammalian and less 'reptilian', they began to develop a secondary palate, separating the mouth and nasal cavity. In early synapsids, a secondary palate began to form on the sides of the maxilla, still leaving the mouth and nostril connected. Eventually, the two sides of the palate began to curve together, forming a U-shape instead of a C-shape. The palate also began to extend back toward the throat, securing the entire mouth and creating a full palatine bone. The maxilla is also closed completely. In fossils of one of the first eutheriodonts, the beginnings of a palate are clearly visible. The later Thrinaxodon has a full and completely closed palate, forming a clear progression. 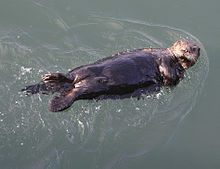 In addition to the glandular skin covered in fur found in most modern mammals, modern and extinct synapsids possess a variety of modified skin coverings, including osteoderms (bony armor embedded in the skin), scutes (protective structures of the dermis often with a horny covering), hair or fur, and scale-like structures (often formed from modified hair, as in pangolins and some rodents). While the skin of reptiles is rather thin, that of mammals has a thick dermal layer. The ancestral skin type of synapsids has been subject to discussion. Among the early synapsids, only two species of small varanopids have been found to possess scutes; fossilized rows of osteoderms indicate horny armour on the neck and back, and skin impressions indicate some possessed rectangular scutes on their undersides and tails. The pelycosaur scutes probably were nonoverlapping dermal structures with a horny overlay, like those found in modern crocodiles and turtles. These differed in structure from the scales of lizards and snakes, which are an epidermal feature (like mammalian hair or avian feathers). Recently, skin impressions from the genus Ascendonanus suggest that at least varanopsids developed scales similar to those of squamates. It is currently unknown exactly when mammalian characteristics such as body hair and mammary glands first appeared, as the fossils only rarely provide direct evidence for soft tissues. An exceptionally well-preserved skull of Estemmenosuchus, a therapsid from the Upper Permian, preserves smooth skin with what appear to be glandular depressions, an animal noted as being semi-aquatic. The oldest known fossil showing unambiguous imprints of hair is the Callovian (late middle Jurassic) Castorocauda and several contemporary haramiyidans, both non-mammalian mammaliaform (see below, however). More primitive members of the Cynodontia are also hypothesized to have had fur or a fur-like covering based on their inferred warm-blooded metabolism. While more direct evidence of fur in early cynodonts has been proposed in the form of small pits on the snout possibly associated with whiskers, such pits are also found in some reptiles that lack whiskers. There is evidence that some other non-mammalian cynodonts more basal than Castorocauda, such as Morganucodon, had Harderian glands, which are associated with the grooming and maintenance of fur. The apparent absence of these glands in non-mammaliaformes may suggest that fur did not originate until that point in synapsid evolution. It is possible that fur and associated features of true warm-bloodedness did not appear until some synapsids became extremely small and nocturnal, necessitating a higher metabolism. However, Permian coprolites from Russia showcase that at least some synapsids did already have fur in this epoch. These are the oldest impressions of hair on synapsids. Early synapsids, as far back as their known evolutionary debut in the Late Carboniferous period, may have laid parchment-shelled (leathery) eggs, which lacked a calcified layer, as most modern reptiles and monotremes do. This may also explain why there is no fossil evidence for synapsid eggs to date. Because they were vulnerable to desiccation, secretions from apocrine-like glands may have helped keep the eggs moist. According to Oftedal, early synapsids may have buried the eggs into moisture laden soil, hydrating them with contact with the moist skin, or may have carried them in a moist pouch, similar to that of monotremes (echidnas carry their eggs and offspring via a temporary pouch), though this would limit the mobility of the parent. The latter may have been the primitive form of egg care in synapsids rather than simply burying the eggs, and the constraint on the parent's mobility would have been solved by having the eggs "parked" in nests during foraging or other activities and periodically be hydrated, allowing higher clutch sizes than could fit inside a pouch (or pouches) at once, and large eggs, which would be cumbersome to carry in a pouch, would be easier to care for. The basis of Oftedal's speculation is the fact that many species of anurans can carry eggs or tadpoles attached to the skin, or embedded within cutaneous "pouches" and how most salamanders curl around their eggs to keep them moist, both groups also having glandular skin. The glands involved in this mechanism would later evolve into true mammary glands with multiple modes of secretion in association with hair follicles. Comparative analyses of the evolutionary origin of milk constituents support a scenario in which the secretions from these glands evolved into a complex, nutrient-rich milk long before true mammals arose (with some of the constituents possibly predating the split between the synapsid and sauropsid lines). Cynodonts were almost certainly able to produce this, which allowed a progressive decline of yolk mass and thus egg size, resulting in increasingly altricial hatchlings as milk became the primary source of nutrition, which is all evidenced by the small body size, the presence of epipubic bones, and limited tooth replacement in advanced cynodonts, as well as in mammaliaforms. Aerial locomotion first began in non-mammalian haramiyidan cynodonts, with Arboroharamiya, Xianshou, Maiopatagium and Vilevolodon both bearing equisitely preserved, fur-covered wing membranes that stretch across the limbs and tail. Their fingers are elongated, similar to those of bats and colugos and likely sharing similar roles both as wing supports and to hang on tree branches. Within true mammals, aerial locomotion first occurs in volaticotherian eutriconodonts. Volaticotherium preserves an exquisitely preserved furry patagium with delicate wrinkles and that is very extensive, "sandwiching" the poorly preserved hands and feet and extending to the base of the tail. Argentoconodon, a close relative, shares a similar femur adapted for flight stresses, indicating a similar lifestyle. Therian mammals would only achieve powered flight and gliding long after these early aeronauts became extinct, with the earliest known gliding metatherians and bats evolving in the Paleocene. Recently, it has been found that endothermy was present as far back as the late carboniferous, with Ophiacodon. The presence of fibrolamellar, a specialised type of bone that can grow quickly while maintaining a stable structure, shows that Ophiacodon would have used its high internal body temperature to fuel a fast growth comparable to modern endotherms. Archaeothyris and Clepsydrops, the earliest known synapsids, lived in the Pennsylvanian subperiod (323-299 Mya) of the Carboniferous period and belonged to the series of primitive synapsids that are conventionally grouped as pelycosaurs. The pelycosaurs spread and diversified, becoming the largest terrestrial animals in the latest Carboniferous and Early Permian periods, ranging up to 6 metres (20 ft) in length. They were sprawling, bulky, possibly cold-blooded, and had small brains. 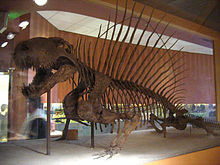 Some, such as Dimetrodon, had large sails that might have helped raise their body temperature. A few relict groups lasted into the later Permian but, by the middle of the Late Permian, all of the pelycosaurs had either died off or evolved into their successors, the therapsids. Moschops was a tapinocephalian from the Middle Permian of South Africa. The therapsids, a more advanced group of synapsids, appeared during the Middle Permian and included the largest terrestrial animals in the Middle and Late Permian. They included herbivores and carnivores, ranging from small animals the size of a rat (e.g. : Robertia), to large, bulky herbivores a ton or more in weight (e.g. : Moschops). After flourishing for many millions of years, these successful animals were all but wiped out by the Permian-Triassic mass extinction about 250 mya, the largest known extinction in Earth's history, possibly related to the Siberian Traps volcanic event. Nikkasaurus was an enigmatic synapsid from the Middle Permian of Russia. Lystrosaurus was the most common synapsid shortly after the Permian–Triassic extinction event. Only a few therapsids went on to be successful in the new early Triassic landscape; they include Lystrosaurus and Cynognathus, the latter of which appeared later in the early Triassic. Now, however, they were accompanied by the early archosaurs (soon to give rise to the dinosaurs). Some of these, such as Euparkeria, were small and lightly built, while others, such as Erythrosuchus, were as big as or bigger than the largest therapsids. After the Permian extinction, the synapsids did not count more than three surviving clades. The first comprised the therocephalians, which only lasted the first 20 million years of the Triassic period. 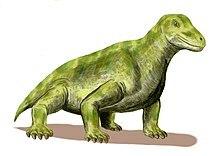 The second were specialised, beaked herbivores known as dicynodonts (such as the Kannemeyeriidae), which contained some members that reached large size (up to a tonne or more). And finally there were the increasingly mammal-like carnivorous, herbivorous, and insectivorous cynodonts, including the eucynodonts from the Olenekian age, an early representative of which was Cynognathus. Cynognathus was the largest predatory cynodont of the Triassic. 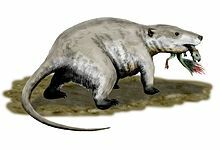 Unlike the dicynodonts, which were large, the cynodonts became progressively smaller and more mammal-like as the Triassic progressed, though some forms like Trucidocynodon remained large. The first mammaliaforms evolved from the cynodonts during the early Norian age of the Late Triassic, about 225 mya. During the evolutionary succession from early therapsid to cynodont to eucynodont to mammal, the main lower jaw bone, the dentary, replaced the adjacent bones. Thus, the lower jaw gradually became just one large bone, with several of the smaller jaw bones migrating into the inner ear and allowing sophisticated hearing. Repenomamus was the largest mammal of the Mesozoic. Whether through climate change, vegetation change, ecological competition, or a combination of factors, most of the remaining large cynodonts (belonging to the Traversodontidae) and dicynodonts (of the family Kannemeyeriidae) had disappeared by the Rhaetian age, even before the Triassic-Jurassic extinction event that killed off most of the large nondinosaurian archosaurs. The remaining Mesozoic synapsids were small, ranging from the size of a shrew to the badger-like mammal Repenomamus. Tritylodon was a cynodont that lived in Early Jurassic. During the Jurassic and Cretaceous, the remaining nonmammalian cynodonts were small, such as Tritylodon. No cynodont grew larger than a cat. Most Jurassic and Cretaceous cynodonts were herbivorous, though some were carnivorous. The family Tritheledontidae, that first appeared near the end of the Triassic, was carnivorous and persisted well into the Middle Jurassic. The other, Tritylodontidae, first appeared at the same time as the tritheledonts, but was herbivorous. This group became extinct at the end of the Early Cretaceous epoch. Dicynodonts are thought to have become extinct near the end of the Triassic period, but there is evidence this group survived. New fossil finds have been found in the Cretaceous rocks of Gondwana. Today, the 5,500 species of living synapsids, known as the mammals, include both aquatic (whales) and flying (bats) species, and the largest animal ever known to have existed (the blue whale). Humans are synapsids, as well. Most mammals are viviparous and give birth to live young rather than laying eggs with the exception being the monotremes. Triassic and Jurassic ancestors of living mammals, along with their close relatives, had high metabolic rates. This meant consuming food (generally thought to be insects) in much greater quantity. To facilitate rapid digestion, these synapsids evolved mastication (chewing) and specialized teeth that aided chewing. Limbs also evolved to move under the body instead of to the side, allowing them to breathe more efficiently during locomotion. This helped make it possible to support their higher metabolic demands. However, more recent examination of the phylogeny of basal synapsids, incorporating newly described basal caseids and eothyridids, returned Caseasauria to its position as the sister to all other synapsids. Brocklehurst et al. (2016)  demonstrated that many of the postcranial characters used by Benson (2012) to unite Caseasauria with Sphenacodontidae and Edaphosauridae were absent in the newly discovered postcranial material of eothyridids, and were therefore acquired convergently. ^ Seeley, Harry Govier (1895). "Researches on the Structure, Organisation, and Classification of the Fossil Reptilia. Part X. On the Complete Skeleton of an Anomodont Reptile (Aristodesmus rutimeyeri, Wiedersheim), from the Bunter Sandstone of Reihen, near Basel, Giving New Evidence of the Relation of the Anomodontia to the Monotremata". Proceedings of the Royal Society of London. 59: 167–169. doi:10.1098/rspl.1895.0070. ^ Laurin, Michel, and Robert R. Reisz (2007). Synapsida: Mammals and their extinct relatives. Version 6 April 2007. The Tree of Life Web Project. ^ a b Romer, A.S. & Parsons, T.S. (1985): The Vertebrate Body. (6th ed.) Saunders, Philadelphia. ^ a b c Carroll, Robert L. (1988). Vertebrate Paleontology and Evolution. New York: W.H. Freeman & Co. ISBN 0-7167-1822-7. p. 397. ^ a b Benton, Michael J. (2005). Vertebrate Paleontology, 3rd ed. Oxford: Blackwell Science Ltd. ISBN 0-632-05637-1. p. 122. ^ "New proto-mammal fossil sheds light on evolution of earliest mammals". University of Chicago. August 7, 2013. ^ Kemp, T.S. (2006). "The origin and early radiation of the therapsid mammal-like reptiles: a palaeobiological hypothesis" (PDF). Journal of Evolutionary Biology. 19 (4): 1231–1247. doi:10.1111/j.1420-9101.2005.01076.x. PMID 16780524. ^ Benton, Michael J. (2005). Vertebrate Paleontology, 3rd ed. Oxford: Blackwell Science Ltd. ISBN 0-632-05637-1. p. 120. ^ Hopson, James A. (1987). "The Mammal-Like Reptiles: A Study of Transitional Fossils". The American Biology Teacher. 49 (1): 16–26. doi:10.2307/4448410. JSTOR 4448410. ^ Hildebran, M.; Goslow, G. (2001). Analysis of Vertebrate Structure (5th ed.). New York: John Wiley & Sons. ISBN 0-471-29505-1. ^ Vickaryous, Matthew K. & Sire, Jean-Yves (2009). "The integumentary skeleton of tetrapods: origin, evolution, and development". Journal of Anatomy. 214 (4): 441–464. doi:10.1111/j.1469-7580.2008.01043.x. PMC 2736118. PMID 19422424. ^ Botha-Brink, J.; Modesto, S.P. (2007). "A mixed-age classed 'pelycosaur' aggregation from South Africa: earliest evidence of parental care in amniotes?". Proceedings of the Royal Society B. 274 (1627): 2829–2834. doi:10.1098/rspb.2007.0803. PMC 2288685. PMID 17848370. ^ Niedźwiedzki, G.; Bojanowski, M. (2012). "A Supposed Eupelycosaur Body Impression from the Early Permian of the Intra-Sudetic Basin, Poland". Ichnos. 19 (3): 150–155. doi:10.1080/10420940.2012.702549. ^ Carroll, R.L. (1969). "Problems of the origin of reptiles". Biological Reviews. 44 (3): 393–432. doi:10.1111/j.1469-185X.1969.tb01218.x. ^ Spindler, Frederik; Werneburg, Ralf; Schneider, Joerg W.; Luthardt, Ludwig; Annacker, Volker; Rößler, Ronny (2018). "First arboreal 'pelycosaurs' (Synapsida: Varanopidae) from the early Permian Chemnitz Fossil Lagerstätte, SE Germany, with a review of varanopid phylogeny". PalZ. 92 (2): 315–364. doi:10.1007/s12542-018-0405-9. ^ Kardong, K. V. (2002). Vertebrates: Comparative Anatomy, Function, Evolution (3rd ed.). Boston: McGraw-Hill. ISBN 0-07-112235-4. ^ Kemp, T. S. (2006). "The origin and early radiation of the therapsid mammal-like reptiles: a palaeobiological hypothesis". Journal of Evolutionary Biology. 19 (4): 1231–1247. doi:10.1111/j.1420-9101.2005.01076.x. ^ Ji, Q.; Luo, Z-X, Yuan, C-X, and Tabrum, A.R. ; Yuan, Chong-Xi; Tabrum, Alan R. (February 2006). "A Swimming Mammaliaform from the Middle Jurassic and Ecomorphological Diversification of Early Mammals". Science. 311 (5764): 1123–7. Bibcode:2006Sci...311.1123J. doi:10.1126/science.1123026. PMID 16497926. CS1 maint: Multiple names: authors list (link) See also the news item at "Jurassic "Beaver" Found; Rewrites History of Mammals". ^ Meng, Qing-Jin; Grossnickle, David M.; Di, Liu; Zhang, Yu-Guang; Neander, April I.; Ji, Qiang; Luo, Zhe-Xi (2017). "New gliding mammaliaforms from the Jurassic". Nature. 548: 291–296. Bibcode:2017Natur.548..291M. doi:10.1038/nature23476. ^ a b c d Ruben, J.A. ; Jones, T.D. (2000). "Selective Factors Associated with the Origin of Fur and Feathers". Am. Zool. 40 (4): 585–596. doi:10.1093/icb/40.4.585. ^ Bajdek, Piotr; Qvarnström, Martin; Owocki, Krzysztof; Sulej, Tomasz; Sennikov, Andrey G.; Golubev, Valeriy K.; Niedźwiedzki, Grzegorz (2016). "Microbiota and food residues including possible evidence of pre-mammalian hair in Upper Permian coprolites from Russia". Lethaia. 49 (4): 455–477. doi:10.1111/let.12156. ^ a b c Oftedal, Olav T. (2002-07-01). "The mammary gland and its origin during synapsid evolution". Journal of Mammary Gland Biology and Neoplasia. 7 (3): 225–252. doi:10.1023/a:1022896515287. ISSN 1083-3021. PMID 12751889. ^ a b Oftedal, O. T. (2012-03-01). "The evolution of milk secretion and its ancient origins". Animal. 6 (3): 355–368. doi:10.1017/S1751731111001935. ISSN 1751-732X. PMID 22436214. ^ a b Oftedal, Olav T. (2002-07-01). "The origin of lactation as a water source for parchment-shelled eggs". Journal of Mammary Gland Biology and Neoplasia. 7 (3): 253–266. doi:10.1023/A:1022848632125. ISSN 1083-3021. PMID 12751890. ^ "Monotremes and marsupials". www.life.umd.edu. Retrieved 2018-08-23. ^ "Life History and Ecology of the Monotremata". www.ucmp.berkeley.edu. Retrieved 2018-08-23. ^ Luo, Zhe-Xi; Meng, Qing-Jin; Grossnickle, David M.; Di, Liu; Neander, April I.; Zhang, Yu-Guang; Ji, Qiang (2017). "New evidence for mammaliaform ear evolution and feeding adaptation in a Jurassic ecosystem". Nature. 548: 326–329. Bibcode:2017Natur.548..326L. doi:10.1038/nature23483. ^ Meng, J.; Hu, Y.-M.; Wang, Y.-Q. ; Wang, X.-L.; Li, C.-K. (2007). "Corrigendum: A Mesozoic gliding mammal from northeastern China". Nature. 446 (7131): 102. Bibcode:2007Natur.446Q.102M. doi:10.1038/nature05639. ^ Gaetano, L.C. ; Rougier, G.W. (2011). "New materials of Argentoconodon fariasorum (Mammaliaformes, Triconodontidae) from the Jurassic of Argentina and its bearing on triconodont phylogeny". Journal of Vertebrate Paleontology. 31 (4): 829–843. doi:10.1080/02724634.2011.589877. ^ Szalay, FS, Sargis, EJ, and Stafford, BJ (2000) Small marsupial glider from the Paleocene of Itaboraí, Brazil. Journal of Vertebrate Paleontology 20 Supplement: 73A. Presented at the Meeting of the Society of Vertebrate Paleontology. ^ "Ancestry of mammalian 'warm-bloodedness' revealed". www.sciencedaily.com. Society of Vertebrate Paleontology. October 29, 2015. Retrieved October 29, 2015. ^ Lambert, David (2001). Dinosaur Encyclopedia. ISBN 0-7894-7935-4. pp. 68–69. ^ Modesto, Sean P.; Smith, Roger M. H.; Campione, Nicolás E.; Reisz, Robert R. (2011). "The last 'pelycosaur': a varanopid synapsid from the Pristerognathus Assemblage Zone, Middle Permian of South Africa". Naturwissenschaften. 98 (12): 1027–34. Bibcode:2011NW.....98.1027M. doi:10.1007/s00114-011-0856-2. PMID 22009069. ^ Bramble, D. M.; Jenkins, F. A. (1993). "Mammalian locomotor-respiratory integration: Implications for diaphragmatic and pulmonary design". Science. 262 (5131): 235–240. Bibcode:1993Sci...262..235B. doi:10.1126/science.8211141. PMID 8211141. ^ Laurin, M.; Reisz, R.R. (2011). "Synapsida. Mammals and their extinct relatives". The Tree of Life Web Project. Retrieved 26 April 2012. ^ Benson, R.J. (2012). "Interrelationships of basal synapsids: cranial and postcranial morphological partitions suggest different topologies". Journal of Systematic Palaeontology. 10 (4): 601–624. doi:10.1080/14772019.2011.631042. Colbert, E. H. (1969). Evolution of the Vertebrates (2nd ed.). New York: John Wiley & Sons Inc. ISBN 0-471-16466-6.